Since its launch, I’ve been using Dark Mode on macOS Mojave. Whilst it took some getting used to (I struggled with Apple Mail at first), it’s particularly useful when you’re staring at a screen for a large portion of the day. However, there’s one app I prefer to use in Light Mode, and that’s Microsoft Word. Is there a way to use Dark Mode on macOS Mojave and choose specific apps to use in Light Mode? Yes, but you have to go via the Terminal. 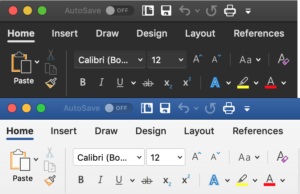 Restart Microsoft Word, and it should now be running using Light Mode, whilst the rest of the OS remains in Dark Mode. Note: This worked at the time of writing- January 2019, on macOS Mojave version 10.14.2. Recently, I’ve been exploring mobile forensics and I wanted to install Scalpel on my new Mac however, I encountered a few difficulties along the way. These steps seemed to resolve my issues so I thought I’d share what I did. Unzip the file and navigate to the root of the folder. At this point, I attempted to run ./bootstrap however, this failed. Part of the issue seems to be that under newer versions of Xcode, (around version 4.4.1 onwards), Apple doesn’t include Autoconf, Automake, and Libtool. This link http://jsdelfino.blogspot.co.uk/2012/08/autoconf-and-automake-on-mac-os-x.html shows a manual way of installing these tools, although there’s an easier way…. You might have heard the news- I finally caved. A couple of weeks ago, I took the plunge and bought myself an iPad. Why did I do that? I have a lot of reading to do right now for my literature review. Considering I travel a lot (read: every day), it’s better for viewing documents whilst I’m on the train each day- the retina display is fantastic. Not only that but if I’m travelling further afield, it’s lighter and easier to carry around than my laptop. I’m not going to sit here and write a full on review of it but in short, I think it’s great. Does anyone have any recommendations for apps that would be useful for keeping track of research papers/PhD stuff etc? So far I’ve got Goodreader and Mendeley. I’m guessing there’s other apps I should have? Thanks in advance. iOS 5 was released to the public on the 12th of October, following the announcement at the Apple event in the previous week. Such was the demand for iOS 5 that Apple’s servers struggled to cope and many users received the dreaded 3200 error. I myself had been eagerly anticipating the new software. Now that I’ve had time to play around with it, I thought I’d give my views on it from the perspective of an iPhone 3GS user. First things first, iOS 5 is definitely faster than iOS 4. If you recall, there were issues when iOS 4.3 was released. When I ran it, my phone seemed to lag and the graphics weren’t as smooth. At the time, iPhone 4 users were also affected and soon after, Apple released an update to rectify the issue. People are saying that the notification centre has been ripped off from Android. I haven’t used an Android phone so I can’t really make a fair comparison. Whatever the case, I think the notification centre in iOS 5 is a useful feature. It’s handy to have one central place to view new messages, emails and events. The new badges/alerts system is nice too- better than the standard popup which was used for everything. This is not a feature which is enabled on the 3GS so its not something I’ve used yet. From what I’ve read, I have mixed feelings about Siri. Sure Siri is a great feature- its practically a personal assistant. Who needs to type a message when you can dictate it to Siri? All joking aside, it does seem to be useful for finding out information. Since it uses voice recognition, I’m also thinking it would be a great tool for disabled users. The downsides? First off a security flaw has been identified where the phone can be accessed by Siri when locked (Tech Radar article). Secondly, Siri appears to have a problem with Scottish accents, as reported by the media (zdnet article). Now I can understand this to a degree. I’m a Scot and even I have trouble with some Scottish accents, after all, some of them are really strong. This isn’t the first time voice recognition has caused problems in the past few years. Hands up if you’ve ever played the Brain Training games on the Nintendo DS. Did anyone encounter any issues (well, apart from being told that you had a brain age well above your actual age)? The games seemed to have a problem with my accent too so it’s not just an Apple issue. Think about the way Scots generally pronounce “seven”. It comes out as “sivin” doesn’t it? Anyway, my first thought when Siri was announced: ” jeez, this is going to encourage more people to talk to themselves on trains”. This is a feature I was looking forward to using the most in iOS 5. Beside a shop? Pick up milk. Approaching your destination on the train? Send an alarm to make sure you haven’t fallen asleep. Sounds great, doesn’t it? Well it’s not so great if you’re the owner of an iPhone 3GS because the location part of reminders has been removed. Why? The iPhone 3GS is more than capable of running this feature since it has GPS. It’s worth noting that the feature was enabled in beta versions of iOS 5. Honestly, why have Apple done this? Your guess is as good as mine (read: making people upgrade to a new phone equals money). On a 3GS, I’m not sure that reminders adds anything more to the OS. I find myself continuing to use the calendar app. Perhaps the reminders feature is for small tasks like picking up items from the shop and the calendar should be reserved for appointments? Another great feature of iOS 5. Users are able to back-up and restore their devices wirelessly using iCloud. Unfortunately, I haven’t been able to get iCloud back-ups to work yet as my computer seems to be confused about its identity. iTunes in the Cloud is also quite a neat idea. Recently, I purchased a track on iTunes (Teardrop by José González if you really wanted to know- it was used in the House season 4 finale) and I quite happily listened to it on my laptop. I wanted it on my iPhone too. Did I have to connect my iPhone to my laptop and transfer it? Nope. If you go into iTunes on your phone, select “purchased” then select “not on this iPhone”, you will be shown a list of all the songs you’ve previously purchased and you can then download them directly to your device. Great for when you’re away from your laptop. iMessage allows you to send messages between iOS 5 devices for free and is basically an IM service. The joke has been made that it’s just like Blackberry Messenger except it actually works (referring to the recent BBM outage). I love the fact that it allows you to send text-like messages to non-phone devices like the iPod Touch. Add Skype into the mix too and provided you have a wi-fi connection, your iPod essentially becomes a phone. iOS 5 has made vast improvements to the iPhone 3GS. The phone appears to be faster and the notification centre is a nice, unobtrusive way of viewing various alerts and messages. iMessages makes it easier to stay in touch with others and iCloud negates the need for the the iPhone to be connected to the computer. All fantastic new features. That said, I’m still a bit disappointed with it. I was hoping that iOS 5 might feature NFC support. Android announced support for NFC when Gingerbread was released at the end of 2010. Since then, Google has created a Wallet system to take advantage of the feature. In May, RIM announced a BlackBerry device supporting NFC and just a few weeks ago, Nokia announced some NFC-enabled games. In this capacity, Apple are seriously lagging behind.